Find Touchplate products & prices - click a category to buy relays, wall plates, 5000 switches, Genesis switches, etc. 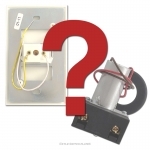 Shop with confidence for replacement Touch Plate switch units, relays, and parts for low voltage lighting systems in new or mid-century homes. 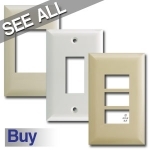 Find Touch Plate switches, relays, and wall plate covers for 5000 series, Ultra, Classic, and Genesis low voltage lighting. Switches are available in a variety of styles for updating your vintage remote control wiring system from the 1940's, 1950's, 1960's, 1970's, and 1980's. You'll also find wiring instruction guides, photo comparisons for identifying the correct control stations, and FAQs for getting your Touch-Plate lighting system working like new. 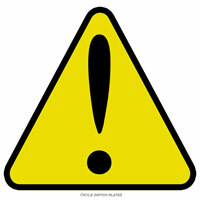 Before purchasing new parts - verify the brand of your relays. Touch Plate switches are often installed in other systems (such as Remcon or Pyramid) that have discontinued their low voltage switches. If that's the case - if your relays are another brand (not Touch Plate) - the replacement parts will be different for your system. If you have Remcon relays - see Updating Your Remcon System with Touch Plate (note: you'll replace broken Remcon relays with new Remcon relays, not Touch Plate). 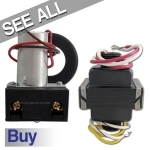 If you have Pyramid brand relays - see Replacement Parts for Pyramid Systems. Standard white devices are a stark white which, when compared to white cover plates and low voltage devices, are the whitest electrical component. See our comparison images below if you plan to mix and match between Touch Plate's various series' of low voltage devices. You'll see that the Ultra & Mystique are a match. Whereas the darker white 5000 series, Classic and Genesis lines are a match in finish. Touch Plate's Ultra & Mystique lines are the closest match to bright white electrical devices, although still not as bright. These two lines are your best options for matching a bright white wall paint or wainscot. The three remaining series from Touch Plate - 5000 Series, Classic and Genesis - are a duller, more off-white finish and are often mistaken for almond since they aren't as bright as the others. You can intermix these 3 series with confidence they will be a match to each other. You can see that although the Genesis, Classic and 5000 Series white finish isn't as stark as the other lines, it's still lighter than the almond and ivory finishes available from Touch Plate. Here, we compare white, almond and ivory with a standard manila folder. The almond is slightly lighter than the folder, while the ivory is darker. Older versions of Touch Plate Classic switches featured red lighted buttons. This vintage style is no longer available. New Classic series switches feature small green LED lights alongside the switches. Shop New Classic Series Switches. View our guide below to find the correct replacement parts for your Touch-Plate system or for updated Remcon, GE, Bryant systems. Please note that when updating your low voltage system with Touch Plate, you'll install 2 replacement Touch Plate buttons (both an "on" and an "off button) for each one of your old GE, Bryant or Remcon switches. You will keep your working relays in place. Any GE or Bryant relays should be replaced with a GE relay and broken Remcon relays should be replaced with a new Remcon brand relay. There is no way to buy the discontinued switches made by GE, Remcon and Bryant, but you can replace the switch and cover plate with Touch Plate. To replace single broken and discontinued Bryant, GE or Rencom switches, you can buy the Touch Plate 5000 series unit with 2 buttons (available in white, almond or ivory), the white Touch Plate Ultra with 2 buttons or the sleek modern white mystique with 2 buttons. One button will serve as an "on" switch and the other will serve as an "off" switch. If one switch is broken, you will need to replace both switches since these have been discontinued. 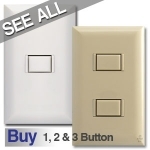 To replace 2 switches in a single plate, you can buy the Classic Series 4-Button Unit or the 4 Button Ultra. 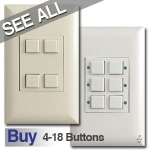 If you're looking to update a plate with 3 old low voltage switches, your options are the 6 Button Classic or the 6 Button Ultra by Touch Plate. If you need to replace 4 Remcon switches, you can get the 8 Button Mystique Lighting Control (without LEDs). 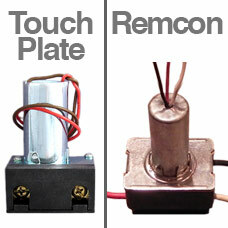 Touch Plate's LED switches will not light up when used in a Remcon system, even if your Remcon switches lit up. 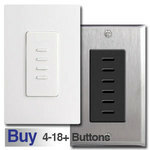 To replace a 9 switch Remcon lighting control panel, you will need the 18 Button Classic Touch Plate Panel. It's important to remember that you will end up with twice as many Touch Plate buttons as Remcon switches. IMPORTANT: Always consult a licensed electrician before attempting any wiring job yourself.